The FMS curriculum takes its roots in the French National Curriculum. It is designed to lay solid foundations for future learning and starts children off with the learning habits necessary to become successful lifelong learners. It is organized around cycles that bridge children’s learning from preschool to Kindergarten and defines skills that children are expected to meet by the end of each year of the program. The curriculum is organized around the Primary Skills (les Apprentissages Premiers). Each skill is essential to the child’s development and offers a core knowledge, which builds on day-to-day experience, hands-on exploration, and authentic interaction. The developing of literacy skills is a key element of our curriculum. Over the course of the Maternelle years (4 years), children will be exposed to letters and sounds in a very progressive manner. Writing will slowly take shape through tracing, hand and finger movements, play dough, pinching and grasping activities to beautifully blossom in Grande Section. Children will acquire pre-reading and pre-writing skills to ensure a successful entry to First Grade. Math concepts are also introduced in the Maternelle years, so that children progressively acquire the fundamentals of numbers, quantity, sequencing and patterning, adding and subtracting. We emphasize the Shaping of Character through the teaching core virtues. We have developed the H.O.P.R.R. model which teaches Honesty (honnêteté), Openness (Ouverture), Perseverance (perséverance), Responsibility (responsabilité) and Respect (respect). Music is fully part of the curriculum. Because we would not conceive to have a French curriculum without teaching our children about some fundamentals in music (‘do, ré, mi, fa, sol, la, si, do!’) as well as some of the most beautiful, kids-friendly masterpieces of the classical repertoire such as Le Carnaval des Animaux (Saint Saens). 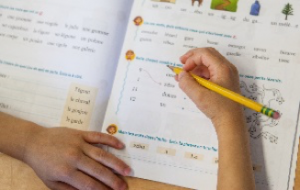 Both language and writing are at the heart of the curriculum and aim at developing verbal skills as well as introducing the fundamentals of writing. Because literacy is a long process that needs both a strong phonemic awareness and a mastery of the alphabetical code, language uses and functions are introduced. Children learn to speak French where the language becomes a vector to access the national identity and culture. The process of becoming literate — learning about all the print forms of language and using them to communicate — begins at birth. In literate communities children come into contact with written language from infancy. This occurs when adults consciously bring children into contact with print (e.g., when they read to children or provide toys with print). Further, children may see print on television or in the environment in general. This exposure to print is the beginning of the process of learning to read and write that continues to emerge throughout the early childhood years. Children’s growing ability to construct meaning from print is viewed as emergent literacy. This content area aims at opening children’s curiosity to the outside world. 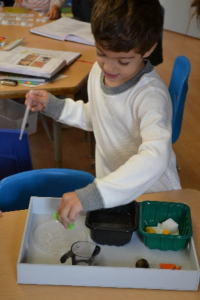 This is done through hands-on activities, field trips, observations and experiences of our physical and living worlds. Children will discover the world of mathematics, biology (i.e. earning about life cycles), earth sciences (i.e. learning about natural phenomenons), physics (i.e. space and time, material transformations), engineering (i.e. man-made inventions, how things work), chemistry (i.e. how liquids interact). It gives children the intellectual tools they need to describe, quantify, classify and organize the reality of facts. 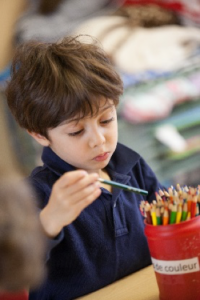 As a first experience with school, the Maternelle sets an academic platform in which children will become life-long enthusiastic learners. It gives children the tools to adapt to a world of people, routines and rules and educates them to the concept of community through the understanding of the social structure and cooperation with others. Emphasis throughout the three-year curriculum is given to autonomy, living together and school work. Children will learn to explore their creative side through arts and crafts projects and will be introduced to the wonderful world of music. While painting and crafting provide children with a means of self-expression, performing arts such as music and acting teach children the value of sustained efforts to achieve excellence and the reward of hard work. They are offered throughout the curriculum as a way to strengthen the expression of emotions and self-confidence. 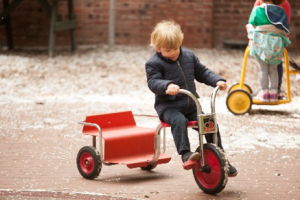 A curriculum wouldn’t be complete without proper emphasis on developing children’s gross motor skills. Physical well-being is important to learning and growth. Daily morning outdoor recess on the playground, or walks to the neighborhood parks ensure that children develop their gross muscles with climbing, running, jumping, skipping, digging, etc. In some groups, yoga is offered. Our after school classes offer an additional option to ensure students have many opportunities to develop their large muscles.